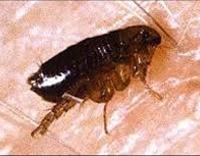 Adult FleaThe council does not have a legal duty to provide a pest control service to control fleas. £42.90 (Incl VAT) for a full treatment for those entitled to any concession. Non domestic properties are charged at £85.80 (Incl VAT) for the initial visit then £71.07 (Incl VAT) per hour or part thereof for each subsequent visit. No treatment will be carried out until the pest control service has positively identified a flea infestation. Do not try to treat it yourself. For safety and legal reasons, we cannot carry out a treatment within 6 weeks of treatment by someone else. If you or someone else has carried out a treatment, we will delay treatment for 6 weeks for your safety. Once the pest control service has positively identified a flea infestation, there are a number of actions you must take before the pest control officer attends to ensure the treatment is effective in the quickest possible time. Make sure there are no non-furniture items lying on the floor. Move all furniture into the centre of the room leaving at least an 18 inch (45cm) gap around floor/wall junctions. If you have any dogs or cats please make sure that they are treated for fleas before we attend. Flea treatments may take more than one visit although this is rare. The insecticides used have an active life of six weeks and will protect you for this time as long as they aren't mopped or cleared away. After treatment you may observe fleas for a short time as there is no treatment which will kill of either the flea eggs or pupae and they have to be allowed to hatch for the insecticide to have an effect. No. There is no way to ensure you will not get fleas in future years.